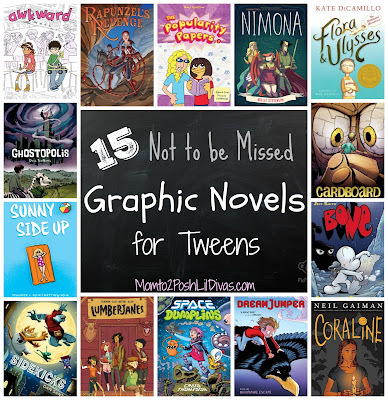 Google+ Mom to 2 Posh Lil Divas: 15 Graphic Novels for Tweens (9-12 Yr. Olds) Not To Be Missed! 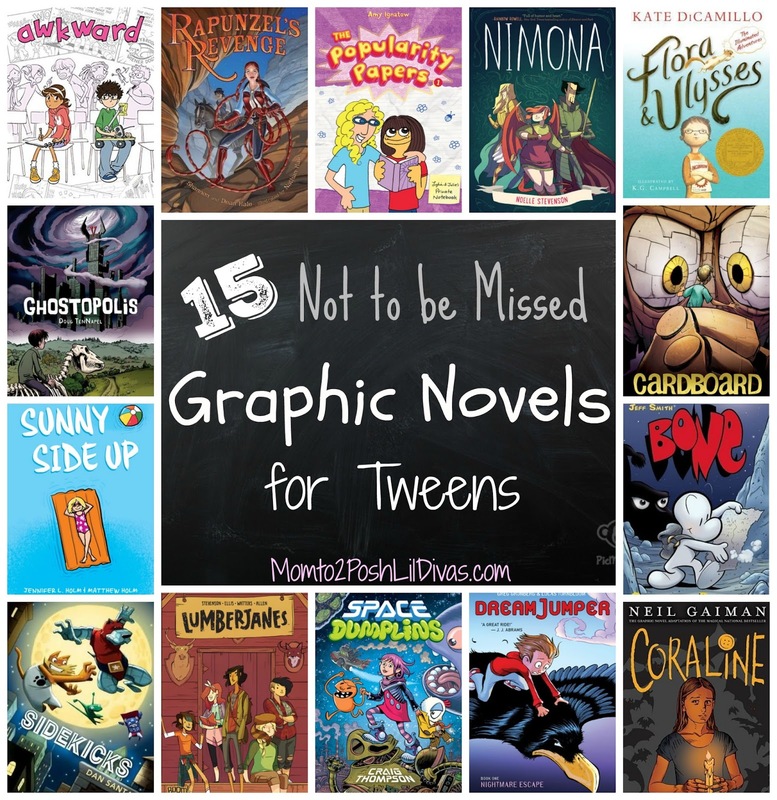 15 Graphic Novels for Tweens (9-12 Yr. Olds) Not To Be Missed! The Oldest Diva is a HUGE fan of graphic novels. It's definitely one of her preferred genre to read so I am always on the lookout for new finds for her to enjoy. We wanted to share a few of our NOT TO BE MISSED recent finds with you. Nimona - Let me start by saying that the Oldest Diva sat down to read this book and never looked back up until she was done. It pulled her in immediately and wouldn't let go. We are hoping there is more in store for Nimona in the near future. The story is one of heroes & villains, magic and lots of heart and humor. Nimona is a shapeshifter. She is also sidekick to a villain. Not what you were expecting? That's the point! Baluster Blackheart isn't your average villain. I won't spoil the plot for you - you have to read it! Bone Series - These books popped up often and I was always hesitant to even take a peek inside. The Oldest Diva came upon this one herself and wanted to read it so I caved. I'll be honest, I'm still not 100% sure what the Bones are but I think that's part of the charm. Either way, the Oldest Diva really enjoys the series and there are quite a few books to enjoy. She finds them very humorous and filled with adventure. The Bones are always up to some type of shenanigans with danger looming nearby (and monsters!). This series is not MY favorite but children will definitely enjoy it. Awkward - Graphic novel meets realistic fiction. The characters and plot are exactly what you'd expect to see in a middle school setting. This one is definitely relatable to the age group it's intended for. It's full of diverse characters which I loved and goes beyond the typical cool versus nerd plot. Peppi and Jamie are in rival clubs (Science vs Art) each vying for a table at the school club fair. The story follows the evolution of their friendship through their competition. Sunny Side Up - This one has undertones of some more serious content but I thought it was handled very well. Sunny is sent to spend the summer with her grandfather in Florida at his retirement home. We find out that her brother is having serious issues with substance abuse and things at home have been anything but sunny. The topic is handled delicately and is a great opportunity to open up discussion with children about drug use. Don't let it make you shy away from the book - it's only a small part of what happens here. The real story is Sunny and her friendships, feelings and transformation. This one is a gem and one of my personal favorites. Cardboard - The story has a sad beginning - Cam has lost his mom, his Dad doesn't have a job and there is no money for birthday presents. So Cam gets a cardboard box for his birthday. Only, it's not just any cardboard box. It comes to life when they build a boxer. Adventure ensues when a spoiled neighbor steals some of the magical cardboard and creates evil monsters. The story has action, lots of heart and is definitely imaginative. Ghostopolis - Written by the same author as Cardboard (see above). The Oldest Diva was pulled in by the creative story, great characters and amazing artwork. Garth finds himself sucked into the afterlife but he's still alive. The book centers around his journey to find his way home. Along the way he finds he has some amazing powers which come in handy as he faces off with Ghostopolis' evil ruler. This one comes highly recommended by the Oldest Diva! Just beware that sensitive children may find some of the images frightening - it is the afterlife after all. Dream Jumper (Nightmare Escape Book 1) - Ben is a Dream Jumper - he travels into other peoples dreams to help them with their nightmares. The story was a quick, fast paced read and a promising start to the series. The Oldest Diva enjoyed it and definitely wants to see where it goes and what happens next. The Popularity Papers - I definitely judged this book by its cover & I'll admit it - I was wrong. When the Oldest Diva showed it to me I tried to convince her to put it back on the library shelf because it looked silly (cheesy). She insisted she wanted to read it so I shrugged it off. Of course, she started reading it right away and all I could hear was her laughing - over and over again. Curious, I sat and read a few pages with her and found myself chuckling too. Lydia and Julie are the kind of characters you can't help but like. They are two 5th grade girls that are determined to crack the code to popularity. The book is their private notebook (the pages look like a handwritten diary). The story was touching and a powerful testament to friendship. The Oldest Diva can't wait to read the next one in the series! If you have a Dork Diaries or Wimpy Kids fan - they won't want to miss this series. Space Dumplins - The artwork was definitely fun and the story was intriguing. Violet is on a mission to find/save her dad. What the Oldest Diva really enjoyed - all the references to potty humor. It simply made her laugh to read about whale poop. There is a storyline here and most kids will probably enjoy it but this was not one of my personal faves as an adult reader. Sidekicks - Captain Amazing is looking for a sidekick. Who better to help him than his own super power wielding pets! This was such a fast, fun feel good read. Who doesn't enjoy pets with superpowers? The story is a great blend of action, adventure, friendship and humor. I can see children having imaginative adventures with their own sidekick pets after reading this one. Dragon Girl - There is just something magical and endearing about baby dragons. Alanna is an orphan who finds dragon eggs and steps in to be a surrogate "mom" to a baby dragon whose mom was killed. The story was a quick, fun read for the Oldest Diva. I must mention that the illustrations are in black and white which is a bit different. Lumberjanes - The Lil Divas are Girl Scouts so I couldn't resist picking up this graphic novel about "scouts". The plot was a bit all over the place and filled with weird magical creatures supernatural elements but the Oldest Diva laughed out loud reading this one so it definitely worked for her. What I liked was that at it's core it was about a strong friendship. Friendship and lots of silly, adventurous moments at camp - basically what any young girl wants for her summer. It was a great summer read and the Oldest Diva has already requested the next novel in the series. Rapunzel's Revenge - We love fairy tales and are always open to exploring a well known favorite with a new twist. That's exactly what we got from Rapunzel's Revenge. The tale is set in the west, with a spunky Rapunzel using her long braids to rope, lasso and wrangle. She is brave and curious and definitely not a damsel in distress. This novel was fun, full adventure and one you'll definitely be glad you read. We'll definitely be reading more by Shannon Hale. Coraline - If you like creepy stories then this one is for you. You may have read the original novel but the graphic novel is perfect for a quick read or to entice reluctant readers who shy away from longer books. I think this book to comic adaptation was well done. It's definitely not for everyone - if your child is sensitive or scares easy you may want to read it first. The story of Caroline and the "Others" is creepy and can be downright scary for some. If you enjoy the book be sure to check out the movie too. Flora & Ulysses: The Illuminated Adventures - This is a hybrid of sorts - it's not 100% a graphic novel, nor is it strictly a chapter book - it's a bit of both. It is also a fantastically clever book that children and adults who have a fondness for children's books will love. Flora is a precocious 10 year old girl. Ulysses is a squirrel who was sucked by a vacuum cleaner and gains super powers. Together they are the perfect team! Who wouldn't want a super squirrel as their best friend? We genuinely laughed out loud reading this book which doesn't happen very often. Despite that, the book dealt with some very real emotional topics such as divorce and loneliness. There is also some advanced vocabulary in the book. I personally like when children learn new words in the midst of a good book. I'll admit even I had to look up a few of them - now that's something! Overall, we found this book funny, entertaining and heartwarming - you won't want to miss it. Don't forget to check out our previously shared list 10 Graphic Novels for Girls (8-12 Years Old for even more amazing graphic novels, it includes some of her all time faves! It as really a cool and useful piece of info. I am glad that you shared this useful info with us. In the end, we recommend you best tours and hotels that give you the best services to have a memorable trip the jewel in Islam's crown. My Assignment Services, is well-known for its 24-hour online Assignment Help on the WhatsApp platform. Students can reach out to us with their queries at any point of the day or night and get the most effective solutions for them. University assessments have to follow specific referencing and citation styles like Harvard, APA, Chicago and MLA. Also, they should be referenced only from credible academic sources. Our best online academic help experts talk about how to select and evaluate the right academic sources, which will help you clear all your academic-related doubts. Assignment Help India by My Assignment Services has been trusted by millions of students worldwide for over a decade. We have been providing complete academic assistance to students struggling with their college and university tasks. We have a team of dedicated subject matter experts who maintain a 100% record of submitting orders well before the deadline. This also gives the students some time to review them and ask for revisions, if needed. You can trust our academic ghostwriters completely to get best quality write-ups including case studies, research proposals, dissertations and essay help, and more. I deeply read your article, the points you have mentioned in this article are helpful for me, thank you so much for share with us. Wonderful post! An opportunity to read a awesome and imaginary blogs, I really like to read your blog, the points you have mentioned in this article are helpful for me, thank you for share this superb blog with us. Awesome post! An opportunity to read a awesome and imaginary blogs, It gives me lots of pleasure and interest, I really like to read your blog, the points you have mentioned in this article are helpful for me, thank you for share this superb blog with us. Awesome post! An opportunity to read a awesome blogs, It gives me lots of pleasure and interest, I really like to read your article, the points you have mentioned in this article are helpful for me, thank you for sharing this blog with us. students assignment help.com provides dissertation help UAE to the students. Due to the problem with grammar and punctuation, you are not able to write your dissertation in a proper way and you need help in your dissertation. You can get help from here because they have a team of experts who give total support in your dissertation writing.